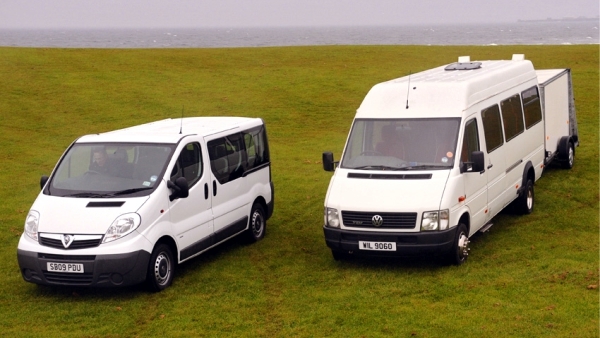 Atlas Minibus, trading successfully since 2003, is run by partners William & Isabel Taylor and is located in Kilwinning and Stevenston, Ayrshire. William is well known around Kilwinning and Irvine, having run his own driving school since 1988. (Yes, an unbelievable 26 years have gone by!) We can supply a range of vehicles (and drivers) with up to 16 passenger seats. We offer excellent service at competitive prices. We recognise that most people aren’t looking for the cheapest but are looking for best value and most importantly, reliability. (Crucial for airport transfers). We will always strive to ensure passengers are safely home at the end of evenings out. We will offer free competitive quotes, if you can tell us the date and times of your planned trip, as well as how many passengers are involved, together with details of any extra pick-up and drop-off points required. We are delighted to welcome new customers, although most of our work is repeat business. We regularly cover work for other companies, because we are known for getting things right and can be relied upon, and have a “can do” attitude. We have industrial premises where we can maintain and look after our small fleet of vehicles and customers are welcome to inspect vehicles prior to making a booking. We regularly visit Glasgow, Edinburgh, Newcastle and Manchester. Airports are a speciality as we have huge luggage capacity with most vehicles. Take as much luggage as you like! We have purpose built Ifor Williams luggage trailers, all purchased new from the factory. Golf outings around Ayrshire and beyond, are very popular, again due to our ability to handle high numbers of golf clubs safely. 16 sets of golf clubs is a lot of luggage! We promise to look after sports equipment and luggage as if it was our own. We can provide child’s booster seats where required, although our larger vehicles all have all-age adjustable seat belts. Our last 4 vehicles were purchased brand new.